We all know that there is nothing cuter than a baby sloth. But eventually the young sloth must assert its maturity and independence. This is often done by embracing all that is dark and "disturbing". By dying areas of its fur to unnatural colors and applying unflattering markings to its face, the soon-to-be-grown sloth tells its parents (and everyone else) that she no longer needs to be told what to do to survive in this harsh, totally fucked up world, OK?!! Sadly (so...very sadly), some sloths never transition from this phase into true maturity. 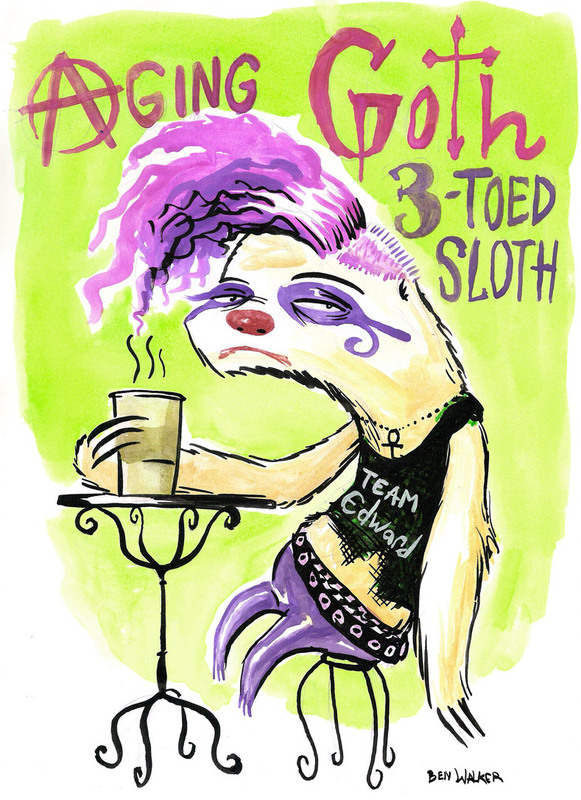 The Aging Goth Three-toed Sloth is a heart-breaking example of a creature who got stuck somehow in its development. She still turns her back on the "Normals" who have long-since grown bored with her once outrageous markings. After decade of brooding and sulking she knows no other way but to go on rebelling against....well, against what, science just can't be sure.